Two hours of Seahawks talk with Kenneth Arthur, Jacson Bevens, Davis Hsu and I.
I will embed it onto the blog at 7pm. I was hoping he’d mix it up and do a Scottish accent this time… Maybe he can throw in some quotes from “Braveheart”. Might wake my son up. It’s 3am here. The video is now embeded on the blog and just waiting for the start. I’d love to hear Rob try to affect a generic American accent. It’s been a few days since the draft, enough time to connect the dots and see the more of the bigger picture emerge. Harper and Durham – Very raw but physically gifted, not team compatible mentally – FAIL. Baldwin – Small and fast, very good route runner – Stated contributing right of the bat. They try to go deep, force defenses to play the whole field, reduce the 9 man in the box looks and have a safe open pass. Add Harvin to the picture as the main beneficiary of the open spaces created when defending the deep pass and the picture is clear. I’ll need someone fast that can be there sooner and not force RW to hold the ball for so long. I’ll need someone that understand the field and the play and knows were and when he should be to make the catch. Paul Richardson – Team captain and the main weapon for his team, a fully developed route runner, perfect into and out of his breaks, lightening speed, the ultimate deep threat occupying a corner + safety on most plays. Over 80 receptions and 10 TDs. Plug and play. Kevin Norwood – Team captain and “mr. clutch” for his QB. Great route runner, understands the field of play, fast and long enough, a QB’s best friend. Yes, my favorite J. Mathews would have fit the bill too but that’s water under the bridge. I think they made a great one two punch on those guys. They would either fit the bill or serve to teach us another valuable lesson regarding what it is we really need. Richardson will beat man cover and Norwood will beat zone. Both make the roster. Richardson will play the red line on early downs providing deep distraction on running downs and a constant big play threat on play action passes, bootlegs etc. Combined with Harvin’s talent to cause damage in space they will force defenses to favor their side of the field and keep safeties focused on that area. They will help the running game be more effective and will break the big play here and there. Kevin will be added to the 3rd and long 4 WR looks counting on his ability to run perfect routes and get open when attention is spread. By 2015 Norwood will eclipse Kearse and Richardson will be able to step in for either Rice or Baldwin down the sideline. Also, when we cry for the Bryants and Moncriefs I suggest we take a long look at other receivers taken by other teams ahead of those guys. We are not the only idiots. Excellent point – I am still in love with the Norwood pick. I think he’s going to be a stud. Norwood has three national championship rings, and Alabama would not have won the last two of their titles without him. He made crucial plays in crucial games. The guy is a winner and someone you can count on when the going gets rough. RW will absolutely love this guy. He will bail out Russ many, many times over the coming years. I think a number of us could clearly see that the Seahawks lacked a SE to stretch the field. What we could not see is that what Pete is looking for is the vertical threat, more-so than the red zone threat. Field Gulls did a great job of demonstrating that Pete’s plan for the Seahawks offense is: 1) power running game; 2) mobile, point guard QB; and 3) quick strike, deep strike aggressive attacking passing game. With Harvin forcing the D to cover sideline to sideline and to flood the underneath zones, all that is lacking is a SE to extend the offense the length of the field. We wrongly assumed that Pete still lusts after a tall SE, but in retrospect, we can see that only a handfull of big receivers (Megatron, Jones, Green) can force a D to cover against the quick, deep strike. None of the bigger receivers available at 32 (Latimer, Moncrief, Matthews, Bryant) can really frighten a D enough for force them to play a prevent style. So, Pete – always several steps ahead of us and everyone else – does a switcheroo and goes DeSean Jackson and selects Paul Richardson. With 20/20 hindsight, the perfect pick. What I appreciate with Baldwin is that he seems to have taken a leadership role in the WR room. I was listening to Baldwin talking to Softy last Sat and he spoke on the culture of the WR room and how they hold everyone accountable. He gave the example of a WR not running and contesting a pass in practice and Baldwin pulled the WR aside and told him in no uncertain terms that what he did will never happen again and apparently it didn’t. I’m positive the receiver he was talking about was Chris Harper. He was cut a few weeks later at the end of camp. I feel pretty good about our draft. It’s nice to see PC making a real effort to draft wide receivers. Hopefully Britt and the other linemen will step in to starting or backup roles. I also have high hopes for Bowie and Bailey. Should be able to find a couple starters out of that group. Now we just got to win the awesome NFC West – they all look pretty tough! Gotta agree with you Eran. We cut through the Broncos like a knife through butter. The way I see it, our defense will stay #1, the only question is whether the line can play as well as last year. Our offense will improve with a healthy line and better blocking. If our smallish wide receivers stay healthy we have an even better receiving group this year. Rice or Mathews may be our tall receiver threat. We got two great running backs and a few others to spare. Also interesting that we are trying to upgrade the fullback spot with a mutant dwarf (the only thing missing is the battle axe, har har). Defense stays elite, offense gets better. That’s a winning formula. Vegas has us at 4:1 odds, Denver 5:1, San Fran 6:1, and New England 8:1. I think that’s about the same as last year??? Fellow 12’s, I’m afraid the time has come to grade ourselves on the Seahawks draft. There is good news, and bad news….and the bad news is not pretty. First, the good news. Rob gets an A+. His tireless work analyzing players and exploring the Seahawks needs is much appreciated by all of us. Rob’s work means there is no off-season. Go Hawks! – Latimer could have been had when Paul Richardson was picked. – In fact, Bitonio could have been had at #32, and there is at least a chance that Richardson could have been there at #64, and if not him, then someone solid like Donte Moncrief. – The R4 picks went somewhat according to conventional wisdom, but beginning R5, John and Pete went off the reservation, and our blog fell flat on its face. – At R5, Jimmy Staten was rated a 4.8, which was among the lowest of any player drafted in even R7. Virtually all of us, given the choice between Staten and John Urschel, OG of Penn State, would have chosen the OG. – At R6, Garrett Scott was chosen over a player all of us would have taken instead, LDT, the Canadian OT. And Eric Pinkins was the Seahawks pick also in R6, when most of us would have taken Daniel McCullers, the 6-7, 352 DT from Tennessee instead. > Yet we all know that John and Pete’s picks will most likely turn out to be better pros than the other guys. All we can do is marvel at the masters and try again next year. I get an A+ for reading all the blog posts!!! But seriously, it is still too early to tell how PC strategy will work out. Sounds like he puts three things high on his list: SPARQ scores, good tape and mental toughness. His misses have been more in the realm of first rounders who have repeated injuries, something that he couldn’t foresee. Perhaps he is rethinking whether he would have taken Carpenter based on the mental toughness part. He certainly surprised everyone by picking Britt, so it is an interesting comparison. Then there was the Bruce Irvin experiment, he didn’t make it as a pass rusher on the line. Irvin is interesting as he was mentally tough in college where he was forced to play on the line. I didn’t see that toughness translate into pros though. He did okay in the first half of the season when he got 8 QB sacks. Many caused by the other side of the line forcing the QB out of the pocket and into Irvin’s arms. Second half of the season was abysmal and no sacks. That is where the mental part got beat down. No real loss for PC draft beacause Irvin is still useful as a linebacker, and may even turn into an elite linebacker some day. Agreed, Alaskahawk. Bruce must hit his stride this year. Last year was heavily impacted by the suspension just as he was changing positions. It will be fascinating to see how much he plays Leo, and how much OLB. Quinn says he is an OLB, but he is listed as a DE on the official roster. With Clems departure, and Avril in a contract year, Leo may be more the need. I deserve my C+. I insisted that we trade back even when Rob pointed out it’s unlikely. I said it will be with a team looking for a QB before Houston. I can’t pick a player for the hawks, but i guess i know when they won’t pick one either. I don’t get all the love for Latimer. He’s a fine possession receiver, but isn’t projected to be remotely close to a deep threat in the NFL. We needed a deep threat, not another possession guy. Richardson’s ceiling has been compared to Desean Jackson; I like this pick more and more as time goes by. The Britt pick might be a bit of a head scratcher, bit IIRC Moses had questions about his motor and drive. Not sure he would have been any safer of a pick. If it becomes clear that Britt isn’t ready to challenge for the starting RT position, Cable will (and should) come under fire. I will be pretty disappointed if our OL performance isn’t quite a bit better next year. If it isn’t, maybe Cable isn’t the right guy, I dunno. I’m actually excited about Scott and Pinkins. I have no idea what to think about Staten. I’ll just take it as a sign that PCJS are confident guys like Hill, Scruggs, Mayowa, etc are going to step up and be solid players for the DL next year. JS said they were interested in Turner if Britt was gone, and that he’s glad they grabbed Britt since that started the run on offensive lineman that would have surely been gone by round 4. I don’t have a problem with Britt over Moses, who appeared on the slow side. I’d like to learn more about Scott. There really hasn’t been much reported about him, I can’t even tell if he’s attending OTAs though I suspect he would have to be. But he seems the one player that they picked against type based on the “passive” label affixed to him by scouts about his play. Hopefully we can find out more about him before camp adjourns. He’s supposedly quite talented even if he lacks a motor. But like James pointed out, he was picked instead of the Canadian tackle. And with only two offensive lineman drafted, it’s important both make the team. They obviously thought Scott had a better shot of competing for a spot than the Canadian, so if he doesn’t earn a spot I’ll be really disappointed they didn’t draft more offensive lineman and blew off bothering to draft even one guard. Rob what was that site you mentioed where yu can view tape on prospects? Ive been being a nube searching on youtube.. Thanks Rob, I love the insight you provide on the teams prospective. You always seem to bring up very interesting perspectives that make us learn more about the PC/JS system. 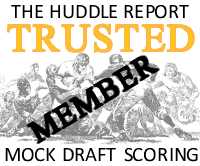 You did a fantastic job with all the different draft scenarios which may have effected your final mock draft. I hope you NEVER get it right, because if you did then the 49’ers, Lambs or Cards might hire you as their draft guru. Thanks for all you do for us 12’s. Interesting discussion of Jackson Jeffcoat. What teams, if any, other than Seattle and Jacksonville, use a pure Leo? I know that Green Bay employs Matthews in the Elephant position, somewhat akin to the Leo, but not the same. Are there any other Leo teams besides these two? As you noted in the discussion, Jeffcoat’s suitors are extremely limited, for he is a pure Leo. He cannot play LB in either the 3-4 or the 4-3, nor can he play the 4-3 DE, so Leo is it. That said, if Jeffcoat plays well in the preseason games, I have no doubt that someone (probably Gus Bradley) will snap him up if Seattle places him on the waiver wire in hopes of the practice squad. Jeffcoat seems to have the natural pass rushing skills that Bruce Irvin lacks, though Jeffcoat needs a significant amount of strength training, by all appearances. The ideal would be for him to tweak something and wind up on IR for the year. If not, the Seahawks will, I believe, stash him in the 53rd roster spot, a’la Mayowa, never activating him, and getting him ready for 2015.